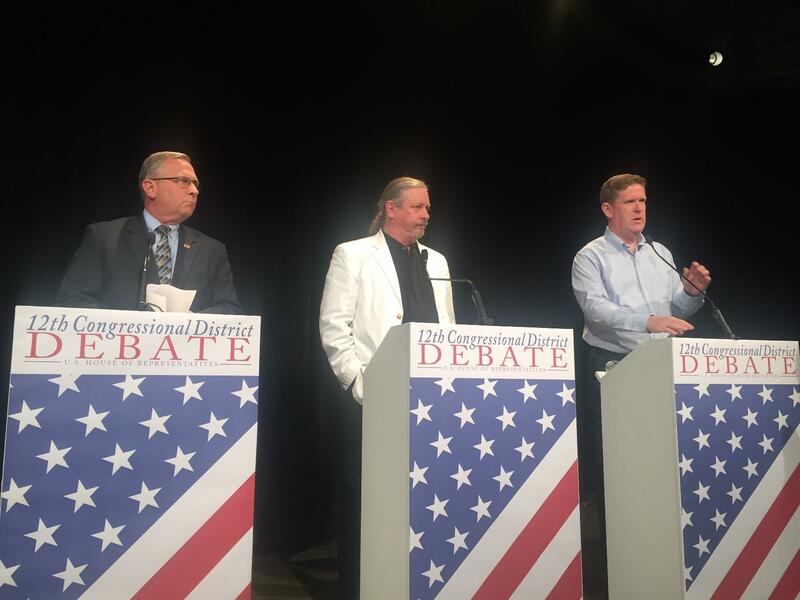 IL 12th candidates Mike Bost, Randy Auxier and Brendan Kelly participated in a 90-minute debate earlier this week in Carbondale. One of the most competitive congressional races in the country is Illinois’ 12th Congressional District. The district includes a significant portion of the metro-east including all of St. Clair, Monroe and Madison counties as well as part of Madison County. Rep. Mike Bost, R-Murphysboro, is running for re-election against St. Clair County State’s Attorney Brendan Kelly, D-Swansea, and Randy Auxier, SIU-Carbondale professor and Green Party candidate. The three candidates met this week for a 90-minute debate sponsored by WSIU, the Belleville News-Democrat and the Southern Illinoisan. Friday’s St. Louis on the Air included excepts of the debate. Even though there are roughly 434 other options, there may not be a more compelling House race in the nation than the contest for Illinois’ 12th Congressional District. The contest between incumbent Republican Mike Bost and Democrat Brendan Kelly features two candidates with impressive track records of public service. While Republicans have gained ground in the district in recent years, the 12th District, which includes the Metro East, has a rich Democratic legacy and political infrastructure that gives Kelly a fighting chance. Randy Auxier, the Green Party nominee in Illinois’ 12th Congressional District, is the latest guest on the Politically Speaking podcast. Auxier is running against incumbent Republican Congressman Mike Bost and Democratic nominee Brendan Kelly. Both Kelly and Bost recorded episodes of Politically Speaking previously. Brendan Kelly, the Democratic candidate in the 12th Congressional District, talked extensively with St. Louis Public Radio’s Jason Rosenbaum about his decision to enter the highly-competitive congressional contest. Kelly is squaring off against Congressman Mike Bost, who became one of the first Republicans to represent the 12th District in generations when he captured the seat in 2014. The Bost-Kelly contest is expected to be one of the most competitive congressional races in the nation this year.